This has been promised since the end of last year, finally here it is here! Previously there was an overview of this wonderful watch, and generally giving you, the avid reader, a gist of what this watch is about. Today is an article from me, at times being a bit of a spoilt brat and rather honest, sometimes too honest. So where to start? This Dodane Type 23 has a very nice matte finish on the case and really draws the eyes to the wrist. Black is a much more noticeable shade, more than any colour, all because the brain notices the lack of colour more than anything else. The dial is also very nice, but here is where I get a little grumpy, the hands and the lume are great, except on one particular hand. The sub-dial at 9 o’clock is for the minute counter of the chronograph, as pilots would use this function a fair amount and possibly in low light, there is the surprising lack of lume on the minute indicator. Making it utterly impossible to read in low light conditions. I do also find the lack of a date window does not help in its’ everyday use. One of my favourite parts of this watch are the lugs, more specifically the screws going through the lugs that hold the pins for the strap. It is just one of those little details that I really enjoy, over engineering, I love it. The strap left me with mixed feelings, at times it was really nice, soft, and padded. At other times I found the strap way too thick, especially where it overlaps on the underside. 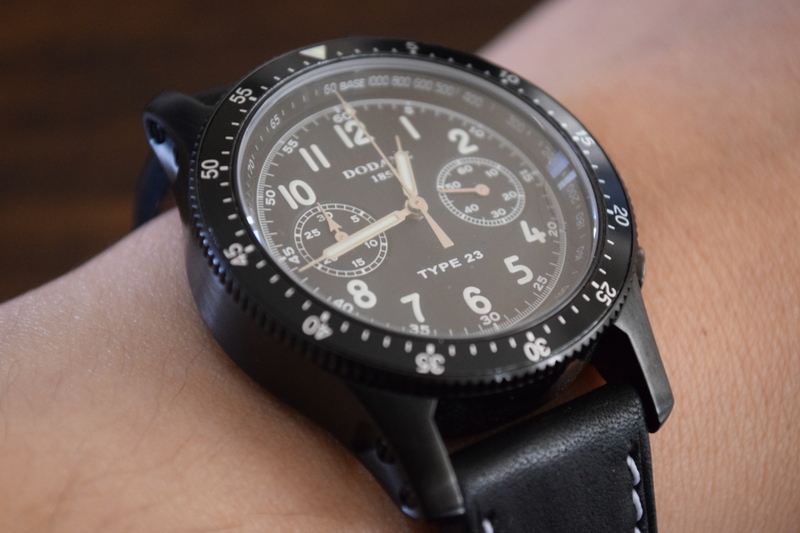 I know it is minor, and I am being extraordinarily picky, but I would prefer this particular watch on a nylon or canvas strap, to really reflect the military feel of this watch. It was hard to wear this watch under a shirt cuff for example, it kept catching and at times always stayed outside of the cuff or always under the cuff. The thickness of the watch and also the strap made even my wrist appear thicker. As an optics man I very much prefer an anti-reflection coating on the crystal, again because of the use in a cockpit. Some people love it, some hate it, I leave it up to you which you would prefer. Dodane have done an amazing job in putting the 42030 movement from Dubois Depraz into the Type 23, the movement is an absolute dream. The usual Geneva stripes and the name/brand logo are to be found on the rotor. Overall the finishing is clean, but not of the highest order like you would find on a Patek or even a JLC. The tactile feel of the pushers belies a confident and secure start to the chronograph function, sweeping round and click. The flyback functionality is a joy to behold, really a great movement and an achievement in itself. At this price point it is really hard to beat. On the wrist, this was a really easy sports watch to wear, big enough to notice, small enough to forget about. I would have preferred, and I thought I would never say this as I have tiny girly wrists, I wish this Type 23 was just that little bit bigger. The dial at times seemed a bit cluttered with so much detail on it, also the bezel with its own thickness makes the face seem even smaller. I had comments coming to me about how nice it looked, the stealth style also attracted a large number of comments and thumbs up. To summarise this really is a lovely timepiece, with very few points that I would change or tweak, but then again I am being really picky and critical. This watch stands up well to my critical eye, and I find it an exceptional proposition. Would I Spend My Hard Earned Cash On One? : Hell Yeah! Any Alternatives? : Baume et Mercier Capeland 10006 (£5110 GBP) Not really a true alternative at this price point. Thanks goes to Elodie and Dodane for providing me with the watch and all the information requested.